In spite of their different personalities Mancini and Haynes must find a way to work together, otherwise the killer might well remain free? Can two equally stubborn headed gentlemen manage to collaborate successfully, as well as solve such a heinous crime? Set in the early twentieth century in mannered and beautiful Dunedin, New Zealand there are plenty of similarities between the stories of Mr Mancini and the delightfully idiosyncratic Hercule Poirot. A cerebral solver of crime, his collaboration with the acerbic Detective Haynes is a nice pairing, and then there is his sounding board, and escaper of tyrannical sisters, neighbour and dog lover. 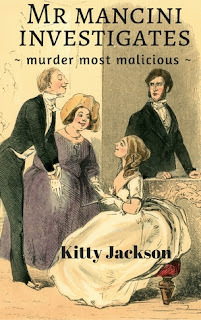 An interesting piece of historical crime fiction, MURDER MOST MALICIOUS is entertaining reading. Great characters, a lovely sense of the time and place, and a good plot into the bargain, I certainly hope this is intended as the opening of an ongoing series. There is a particularly large cast here though, so you will need to pay attention, particularly as the body of the woman found in the Winter Garden Glasshouse is identified and connected to a group of would be writers that Mr Mancini belongs to, so his investigation starts to work it's way through friends, acquaintances, fellow would-be writers and locals. There's good pace, a great sense of place and a nice balance between the personal back story of Mancini and his colleagues, as well as the victim and her contacts in the local community. Mancini's connection with the police is well handled and all in all there is a lot to really like about MURDER MOST MALICIOUS.